Identifying and Measuring Chronic Poverty: Beyond Monetary Measures? Despite the renewed commitment over the past 15 years to the reduction of poverty as the core objective of international development discourses and policies, progress to this end remains disappointing. (UNDP, 2003; UN Statistics Division, 2004). This inadequate progress raises important questions about the policies and strategies adopted to achieve poverty reduction, as well as about key international issues, including aid, debt, trade and conflict reduction. It also raises important questions about our very conception and understanding of poverty. 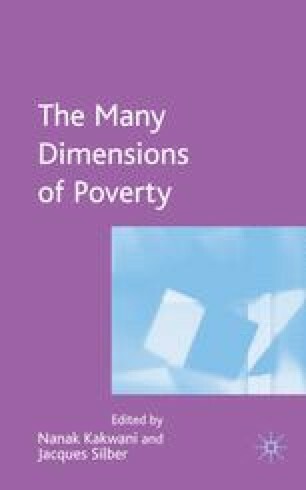 While perspectives on poverty have evolved significantly over this period, with widespread acceptance of the multidimensional nature of poverty, and of the importance of considering the depth and severity of poverty, there has been slower progress in recognising and responding to the persistence of much poverty over time (Clark and Hulme, 2005); in other words, the phenomenon of chronic poverty. For many people poverty is not a transitory experience or a seasonal problem: it is a situation from which escape is very difficult, most emphatically illustrated by deprivation which is transmitted from one generation to the next. At present, chronic poverty is still not seen as a distinct and important policy focus. This is a significant area of neglect both because a substantial proportion of poverty is likely to be chronic (CPRC, 2004), and because it is likely to call for distinct or additional policy responses that can tackle deep structural obstacles. DFID (1999–2001), Sustainable Livelihoods Guidance Sheets. London: DFID. Available at http://www.livelihoods.org/info/info_guidancesheets.html. Kabeer, N. (2005) ‘Snakes, Ladders and Traps: Changing Lives and Livelihoods in Rural Bangladesh (1994–2001)’, Chronic Poverty Research Centre Working Paper 50, University of Manchester, UK. Available online at http://www.chronicpoverty.org/pdfs/50%20Kabeer.pdf. Lawson, D., A. McKay and K. Moore (2005) ‘Panel datasets in developing and transitional countries (version 1–07, 2003)’, Chronic Poverty Research Centre, University of Manchester, UK. Available at http://www.chronicpoverty.org/pdfs/PanelDatasetsVersion1july%202003.pdf. Moore, K (2001) ‘Frameworks for Understanding the Intergenerational Transmission of Poverty and Well-being in Developing Countries’, Chronic Poverty Research Centre Working Paper 8, University of Manchester, UK. Available online at http://www.chronicpoverty.org/resources/working_papers.html. Ranis, G., F. Stewart and E. Samman (2005) ‘Human Development: Beyond the HDI’, Economic Growth Centre Discussion Paper 916, Yale University. Available at http://www.econ.yale.edu/—egcenter/EGCdp4.htm (Later published in the Journal of Human Development, 7(3), 2006, 323–51). UN Statistics Division (2004) Progress towards the Millennium Development Goals, 1990–2004, Available at:http://millenniumindicators.un.org.